"The largest" superbloom in some time — think a decade-plus — is here. The Wildflower Trail near Diamond Valley Lake is having its petal-perfect moment as the final third of March 2019 begins. Books that shared lessons from the natural world grew popular a few decades ago, with "a lesson from the sun" and "a lesson from a starfish" filling the shelves, as well as the minds and hearts of nature lovers. And if we were to take some lessons from a California wildflower, it would be these: Slow down. Bloom in place. Don't hurry. Don't worry. And let other wildflowers have their space. It's solid advice in these wildflower-mad days, when so many of us are seeking a splendid moment among all of those gorgeous poppies and blue arroyo lupines carpeting various areas of Southern California. 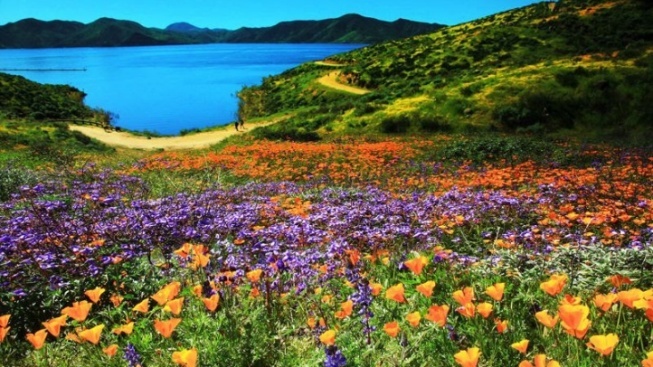 Including, now, Diamond Valley Lake Marina, where "the largest superbloom in over a decade has finally arrived" as of the third week of March 2019. We'll interpret that as "stick to the trail."